The pilot of the plane which crashed with UKIP leader Nigel Farage on board has been charged with threatening to kill him in a separate incident. 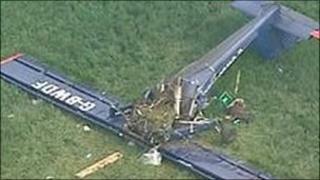 The aircraft came down in Hinton-in-the Hedges airfield, Northamptonshire, on 6 May - the day of the general election. Justin Adams, 45, from Faringdon, Oxford, appeared before magistrates in the city on Tuesday charged with two counts of making threats to kill. He was remanded in custody to appear before the same court on 7 December. It is believed the second count Mr Adams faces relates to the threatening of an aviation official. The pilot was arrested at his home by Thames Valley Police on Sunday and charged the following day. An Air Accidents Investigation Branch (AAIB) report said the crash happened when the banner trailing behind the plane became entangled in the tail-fin. This caused the plane's nose to drop, the report said. Although Mr Adams "maintained some control of the aircraft" he could not prevent it crashing, the report added. Mr Farage suffered broken ribs, bruised lungs and facial injuries, while Mr Adams was trapped in the wreckage of the aircraft for a time and also needed hospital treatment. Mr Farage was campaigning against Commons Speaker John Bercow for the constituency of Buckingham at the time of the crash. He failed to take the seat from Mr Bercow.